If life is killing this Icelandic rock act's rock 'n' roll, then they're bringing it back to life with their latest. Life Is Killing My Rock 'n' Roll, is a noisy, stylish collection of classic rock melded with plenty of feedback, a wall of guitars, and plenty of hip-ness and coolness exuded in every note. Think of a band brought up on Brit-pop, garage-rock, and '70s arena rock, all while experimenting with acid, and you'll have a vague idea of what this act is about - or rather, capable of. 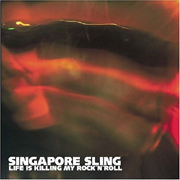 A refreshing, blurring line between genius and insanity, Singapore Sling walk it with nary a doubt, their rock 'n' roll swagger unmistakable as they command attention - and get it. I'll give this an A-.